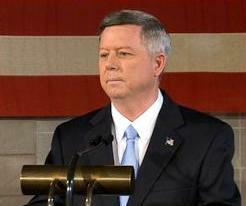 LINCOLN, Nebraska, February 21, 2014 (ENS) – A Nebraska judge on Wednesday declared unconstitutional a state law that had allowed Governor Dave Heineman to approve the route the Keystone XL pipeline would take through Nebraska. Pipeline opponents and the three landowners who brought the case are declaring victory, but the state of Nebraska is appealing the decision. Lancaster County District Judge Stephanie Stacy ruled that the state legislature could not take the routing power away from its elected Public Service Commission and allow the governor to decide the route and seize property for the route through the power of eminent domain. The ruling includes a permanent injunction that bars the governor and the Nebraska Department of Environmental Quality from authorizing the pipeline under the unconstitutional law, LB 1161. As a result, there is now no approved route for the controversial pipeline through Nebraska, which will delay the federal process for determining whether or not the project is in the national interest of the United States. As proposed, the $5.3 billion pipeline would carry diluted bitumen from the Alberta tar sands across the Canada-U.S. border to refineries on the Texas Gulf Coast. Because it crosses an international border, TransCanada needs a Presidential Permit to proceed, but such a permit would be issued only if the President determines the project is in the U.S. national interest. This is the second time the route of the pipeline across Nebraska has stalled the federal process. 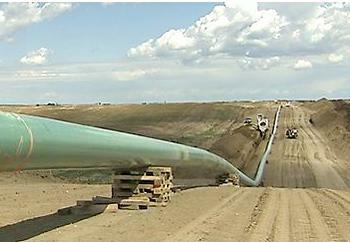 In November 2011, Nebraska passed new pipeline siting laws to handle TransCanada’s Keystone XL proposal. The following January, President Barack Obama rejected TransCanada’s application for a cross-border Presidential Permit after Congress passed a law requiring it to be approved or denied within 60 days. Obama denied the permit because the deadline required a decision before Nebraska had proposed a route, preventing federal review of that route. At issue in the Nebraska section of the 1,179-mile pipeline route are concerns over the pipeline’s potential impact on Nebraska’s environmentally sensitive Sand Hills region, which overlies the Ogllala Aquifer. This underground pool of water is one of the world’s largest reserves of fresh water. The aquifer spans eight states, provides drinking water for two million people, and supports $20 billion in agriculture. Critics say that a major pipeline leak could ruin drinking water and devastate the Midwestern economy. TransCanada changed the original proposed route of Keystone XL to minimize “disturbance of land, water resources and special areas” and the new route was approved by Nebraska Governor Dave Heineman in January 2013. But pipeline opponents warn that the second route proposed only shifted the pipeline by 19 miles and would still run the pipeline across some of the most sensitive portions of the Oglala Aquifer. “Citizens won today,” said Jane Kleeb, director of the anti-pipeline nonprofit group Bold Nebraska. “We beat a corrupt bill that Gov. Heineman and the Nebraska Legislature passed in order to pave the way for a foreign corporation to run roughshod over American landowners.